There has been a great deal of modern advances in flooring over the last several years and vast options for beautiful laminate flooring is a testament to those new technologies. Though you may not be able to afford original hardwood flooring, it doesn’t mean you have to sacrifice style and quality. Laminate flooring can be the perfect substitute or a first choice due to the vast variety of options that homeowners have to creating a stunning flooring designs. You have the benefit of it looking like wood for a fraction of the cost. Naperville Hardwood Floor Refinishing has excellent workmanship that you can trust to install your laminate flooring to perfection. For most of us aesthetics is important and we want our home to look good without breaking the bank to do so. Laminate flooring is an affordable material and far less costly than hardwood flooring and you do not have to sacrifice quality over cost. It’s a flooring that offers a wide variety of styles that are to some people undetectable from wood. In many cases only a professional hardwood flooring professional can tell the difference between laminate and hardwood flooring. That is how well manufactured many laminate flooring products are in the current marketplace. In many cases the color and texture of laminate is so much like wood that even you might forget you do not have hardwood flooring. Many people like wood because it can last for more than 100 years. It’s a great quality but laminate flooring tops wood in many features because not only is it durable it is also moisture resistant. So you don’t have to save forever and a day for hardwood flooring when you can get a beautiful laminate floor installation for a fraction of the cost, plus never need to worry about water and moisture damage because it’s a tough material that is also scratch resistance and can withstand the tough strong blazing light of the sun. It’s no wonder that laminate is such a popular choice for homeowners who want “wow” factor with additional cost benefits. Of course, hardwood flooring is gorgeous but some people just don’t have the time or resources to dedicate to the special cleaning it needs. You need appropriate cleaning solutions so that your wood flooring is not damaged but with laminate you can quickly clean up dirt and spills with a simple vinegar and water solution that fast and easy. If you’re a household that doesn’t have a great deal of time for domestic tasks and you need to clean and run then laminate is a great material that looks good and doesn’t require tedious specialty cleaning to look good and be fully restored after dirt and dust settles on it. 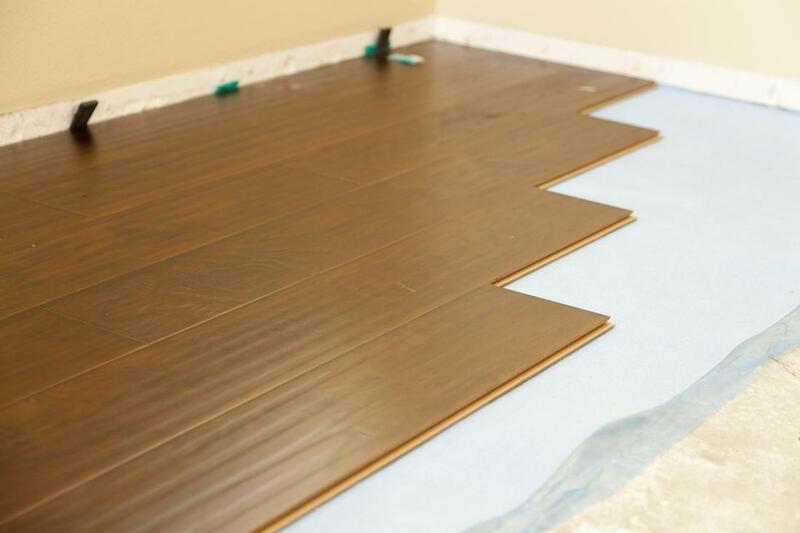 If you are seeking laminate flooring in Naperville that offers a vast selection of choice and excellent installation, there is no other flooring expert to call than Naperville Hardwood Floor Refinishing. We will take your flooring installation to the next level by providing you with beautiful options that don’t sacrifice quality and durability for affordability.